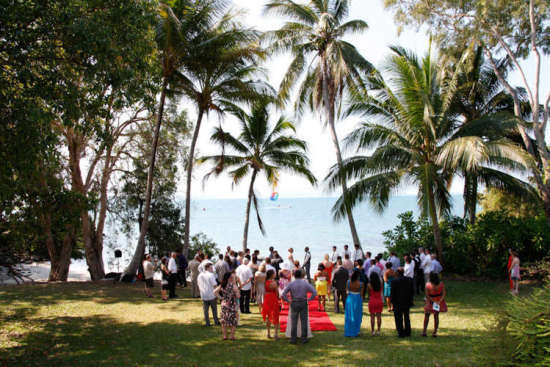 Add a little 'wow' factor to your wedding and whisk your guests away to Port Douglas for a tropical destination wedding. With an awesome year round climate, blissful beaches and a variety of scenic rainforest backdrops, there are endless venues to choose from to tie the knot. Here are some of our favourites to inspire you. anywhere or worry about getting everyone to the reception. 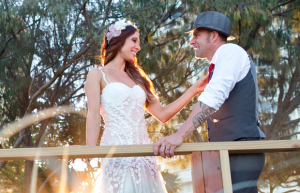 Onsite you will find a beauty salon, sap facility, fitness centre, restaurants and lounge areas, a wedding chapel and plenty of stunning locations on the grounds and Four Mile Beach for photo opportunities. Accommodation comprises of guest hotel rooms and stylish split-level two, three, and four bedrooms villas, so all the family can stay together. Enjoy good times and chilled out glamour at Port Douglass Resort. The contemporary yet quirky tropical feel brings imagination, savvy and style with chic designer finishes to top off a wedding in paradise. Whether its a party by the pool, cocktails at the bar, sophisticated dining at the Bazaar Restaurant or a banquet in the function room, Port Douglas Resort will ensure you have a fabulous wedding to remember. space for a tropical wedding, the integrated indoor/outdoor design of the restaurant allows the pond and pool to became the perfect relaxed backdrop. Relax and unwind at SpaQ, they will tailor packages to fit in with your individual groove. ith exclusive rooftop spa and BBQ sun deck areas. Dive out from your swim up apartment into the grand lagoon and swim accross to the bar for your morning espresso or lunchtime cocktail. The penthouse apartment are idea for entertaining with a BBQ and rooftop spa. The resort features 4 stunning, romantic ceremony venues for your perfect wedding day and 5 reception venues to choose from. Sea Temple Resort & Spa is able to host both your ceremony and your reception for up to 120 guests. Magical, Romantic, Lavish sums up this spectacular rainforest ballroom. This unique venue certainly has the 'wow factor' that will take guests into a world beyond imagination. Situated in a pristine natural environment, this ultimate wedding reception offers total privacy and exclusivity with no noise restrictions. Featuring an elegant, black silk lined marquee, highlighted by stunning, handmade crystal and budlight chandeliers, and complemented by a backdrop of budlight stars to the rainforest canopy, this will be like nothing your guests have ever experienced! 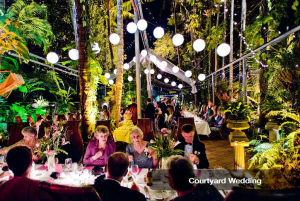 Located only ten minutes from the heart of Port Douglas, Flames of the Forest caters for couples who want to celebrate an elopement with a romantic dinner for two, small family weddings, or the ultimate wedding reception for 200 guests.Choose from a stand up cocktail function, to a lavish banquet or traditional three course reception, with a range of table linens, centre pieces and chair covers to compliment. The Sugar Wharf is an iconic heritage listed structure and one of Port Douglas’s most sought after venues. Located on the waterfront of Dickson Inlet with views of the surrounding Daintree Mountains and Coral Sea, this historic old building was home to Ben Cropp and his “Shipwreck Museum” for many years, but is now open to the public as a wonderful waterfront venue. Outdoors on the deck is a stunning location where guests can enjoy canapes and a cocktail while watching the sun set. Just behind the Sugar Wharf is the popular St Mary’s by the Sea chapel, available for ceremonies seven days a week. Nearby is little beach and cove perfect for some casual photos after the ceremony. Sugar Wharf can accommodate 120 on the deck and 200 inside. Looking for a spectacular place to elope? How about landing on your very own desert island in the middle of the Great Barrier Reef! Board your private helicopter and escape to paradise. Departing from Port Douglas, take in the breathtaking coastal scenery and the unique aerial perspective over the Great Barrier Reef, as you travel in style and comfort. Nestled in the turquoise waters of the Coral Sea, you will arrive to your own pristine coral sand cay, surrounded by magnificent coral reefs...just magic for an intimate celebration. 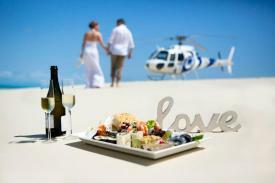 Afterwards relax, swim, snorkel and indulge yourselves with a gourmet meal of tropical platters and premium beverages. Niramaya provides a private, relaxing, romantic getaway in the most luxurious surrounds.Featuring 1, 2, 3 & 4 bedroom Balinese style self-contained villas. Spread over 15 hectares of tropical gardens. Each beautiful spacious villa comes complete with private courtyard and plunge pool. 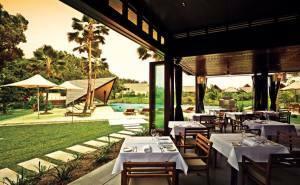 The poolside restaurant comfortably seats up to 60 guests (120 with extra seating) and specialises in Asian fusion dishes. The function centre can be configured to meet your needs with a full commercial kitchen and bar available for all your catering requirements. Choose from banquet style, stand up cocktails functions, set degustation menus or fully seated 3 course dinner. The extensive tropical gardens make an ideal wedding ceremony location and abundant opportunities for photo opportunities. Guests can then transition accross to the restaurant following the ceremony with ease. Tip: Treat yourself to the ultimate couples spa package at the Niramaya Day Spa. Tailoring treatments for bridal couples, Niramaya spa features a private couples room complete with spa bath. Share a 60 minute rejuvenating massage, relax and reconnect with a private and tranquil bath, and indulge on French Champagne and decadent chocolates! Simplify your wedding preparations by choosing a luxury villa where you can host the ceremony, reception and spend your honeymoon. The Bali House is a beautiful residence inspired by contemporary South East Asian design. Located in the exclusive gated community of Beachfront Mirage Estate, this 5 star architecturally designed house combines impeccable attention to detail, world class finishes and a wealth of luxury inclusions. Featuring 5 bedrooms, 4 bathrooms, the house is surrounded by open verandas, complete with a heated swimming pool & cabana, gourmet kitchen, expresso machine and tennis court. The villa is the perfect place for families and friends to be together. 7 Wharf Street is one of Port Douglas' most sought after properties. Situated in a prime location in the heart of Port Douglas, this architectually designed holiday home is in every sense a landmark property. Designed by architect Alex Gencur, this pavilion style holiday home nestles beautifully into its rainforest hill slope location, taking in 180 degree uninterrupted views across the Coral Sea, Low Isles, Snapper Island and the Daintree Rainforest Mountains. pavilion. A chef's kitchen is well equipped and comes with an extra cool room and refrigeration for entertainers. 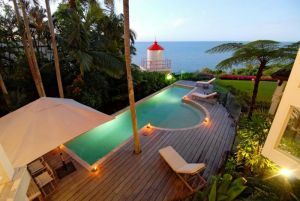 The second pavilion holds a master suite which is one of the most exclusive in Port Douglas, taking best advantage of the incredible views this holiday house offers, but with all of the modern luxuries including a wet shower ensuite and walk in robe. With 4 Bedrooms and 3 Bathrooms, this is an amazing property to share a stylish intimate wedding. Its location and beauty can only be appreciated by visiting! Four Mile Beach provides a spectacular backdrop for a beach wedding. Lined by coconut palms and golden sand as far as the eye can see, this peaceful paradise is completely unspoilt. The northern end of the beach which connects with Macrossan Street is the most popular part with beach hire, a stinger enclosure and life guard patrols. Beyond this Four Mile Beach is free from development, naturally beautiful and serene. All resorts and buildings are tucked away behind the vegetation. Take your pick and choose to have your ceremony nestled amongst the palms or on the flat sands of the beach. Our tropical climate provides perfect conditions for an outdoor wedding, and June to October is the most popular time to tie the knot. Little Cove is a secret little spot tucked away just out of sight behind Rex Smeal Park. This private and beautiful setting is framed by coconut palms and grassy areas. Perfect for an elopements or intimate weddings, there are plenty of beautiful spots for natural photos nearby many great restaurants/reception venues within walking distance. Thala Beach Nature Reserve is located just 15 minutes south of Port Douglas, situated on a private headland overlooking 2km of untouched coastline and sheltered coves. This exclusive luxury haven provides a natural and secluded environment, ideal for private elopers and boutique weddings of up to 60 guests. Accommodation comprises of 83 deluxe timber bungalows built high on stilts and spread throughout the forest canopy. There are 4 types of bungalows for your guests to choose from, so they can stay overnight and continue the wedding celebrations. 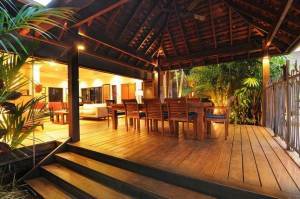 Thala has its own secluded beach frontage lined by coconut palms and coastal sheoak trees. 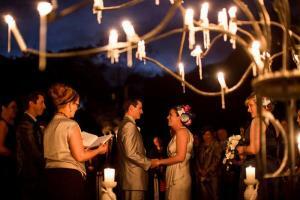 Other venue options include an intimate forest setting or indoor wedding. Views from the restaurant are panoramic, taking in the Far North Queensland coast from Double Island to Cape Tribulation. St Mary’s by the Sea is very popular with couples from all over the world choosing to exchange their vows at this lovely chapel. It is one of the oldest buildings in Port Douglas, built in 1880 and lovingly restored to its former glory by the Port Douglas restoration society in 1989. It now sits in the heart of Port Douglas at the northern end of Macrossan Street adjacent to Rex Smeal Park, Little Cove, and the Historic Sugar Wharf. This fully restored non-denominational chapel provides a casual yet traditional setting for a wedding ceremony, with its beautiful wooden Silky Oak pews, original timber flooring, a high pitched ceiling and tropical themed stained glass windows that have fish and shells all over them. The views of the Coral Sea and surrounding mountain ranges from the huge glass altar window is exceptional. 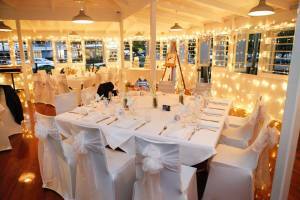 St Mary's by the sea is an affordable, truly beautiful venue for your special day. It can comfortably seat 80 guests in air-conditioned comfort, and around 100 with limited standing room at the back. The Crystal Chapel is located on the grounds of the Sheraton Mirage Resort overlooking Four Mile Beach. Surrounded by lush tropical gardens, this stunning venue features high ceilings, stained glass inlays and glass walls for sensational 360 degree views. The chapel seats up to 30 guests (or up to 50 with standing room), where you can exchange your vows in air-conditioned comfort. The grounds of the Sheraton Mirage offer superb photo opportunities with 130 hectares of lush tropical gardens, 2 hectares of sparkling saltwater lagoon pools and Four Mile Beach right on the doorstep. Afterwards enjoy a cocktail party by the pool, or a fairy tale dinner at with exquisite cuisine at Il Pescatore Restaurant. St David's Anglican Church is located in the township of Mossman, just a short scenic 15 minutes from Port Douglas. This small stone structure is built in an almost gothic style. The building has beautiful stain glass windows, and features a mosaic of our Lord Jesus Christ. The chruch is beautifully set behind an avenue of eleven mature raintrees that have grown either side of the Captain Cook Highway, forming a stunning archway. This avenue contributes substantially to the setting of St David's, which is considered to be of State-level cultural heritage significance. From the church looking west there are views over George Davis Park with cane fields behind, and distant views of the Main Coast Range (part of the Great Dividing Range) and the Daintree National Park. Salsa is the ultimate wedding venue to celebrate your big day with friends and family. 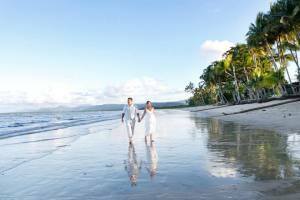 Located just across the way from St Mary’s by the Sea Chapel, the romance of this tropical Queenslander will set the perfect scene for your Port Douglas wedding. Salsa Bar & Grill is a well known restaurant, much loved by locals and many return tourists. 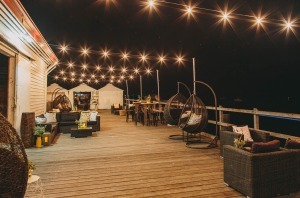 Having hosted weddings in Port Douglas for over 20 years, Salsa's reputation is derived from its amazing and eclectic menu, extensive wine list, professional and friendly staff, as well as a bustling and vibrant atmosphere. This open plan Queenslander style restaurant is capable of catering to for up to 120 guests ‘sit down’ or 200 guests ‘stand up’ canapé style. The restaurant is available for exclusive use or partial use depending on your requirements. Whatever you choose from the menu you will be swept off your feet, not only by the taste but the presentation! 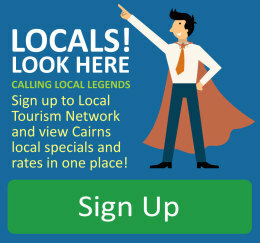 Nautilus is an iconic Port Douglas restaurant that has been in operation for over 60 years. Providing a magical setting for wedding guests, Nautilus combines the beauty of the tropics with elegant dining, in a unique outdoor setting. Guests who enter along a hidden pathway from Macrossan Street will discover an awesome restaurant that is like stepping into another world. Surrounded by the beautiful rainforest gardens, Nautilus can accommodate up to 150 guests for seated dining across 3 areas, each with its own character and natural beauty. Choose from a 3 course set menu or the “full Nautilus experience” with a 5 or 7 course Degustation. Add some entertainment to your evening with a one or two piece band and enjoy an evening dancing under the stars. 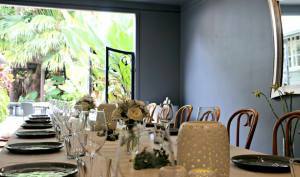 Queenslander, this award winning restaurant and premier events venue encapsulates quintessential tropical dining. The colourful gardens create a wonderful atmosphere for romantic dinners,live music and weddings. Inside the sleek ‘Feasting Room’ can accommodate up to 24 guests for increasingly popular smaller weddings. The general restaurant dining space can either be hired out exclusively for up to 150 guests. The menu draws from classic French cuisine and a love of British food culture. You will find twists on old favourites such as crisp pigs ears, 14hr slow roast lamb shoulder, beef cheeks & tail, chicken liver parfait and treacle tart. The feasting menu (share plates) is a popular option for wedding parties with a plethora of delectable delights for guests to choose from. Silky Oaks Lodge is a luxury boutique eco lodge situated on the banks of the Mossman River, just a short 20 minute drive north of Port Douglas. Here you will be transported into a magical world, immersed in the beauty and romance of the rainforest. Accommodation comprises of luxury Riverhouses & Treehouses for couples. All accommodation is contemporary with impeccable attention to detail with divine skincare products, robes and slippers and an evening turndown service including dimmed lighting and soothing music to set the mood. The Riverhouses provide an extra touch of luxury, perched right on the edge of the river, you can lie in your hammock listening to the sounds of the rainforest and the river below. 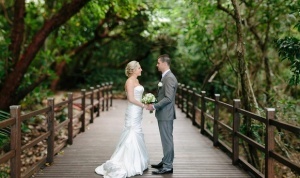 There are various locations to set a beautiful rainforest wedding and reception. Choose from a romantic riverside wedding ceremony then dine in seclusion under a canopy of the rainforest, surrounded by flame torches and candles. The Treehouse Restaurant is set above the river, offering sensational views of the surrounding rainforest. Come evening the river below is lit by floodlight and is absolutely spectacular. The Jungle Perch function space is ideal for a small intimate gathering away from the main restaurant. 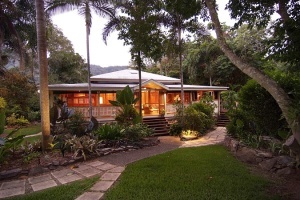 Nestled in a private valley, the Daintree Eco Lodge combines a nature, nurture and culture rainforest experience. Enter a world of special sites, ancient bush walks and traditional practices - a wedding experience you won't find anywhere else! Very few places are left on our planet where you can enjoy a wedding ceremony in such a pristine environment. 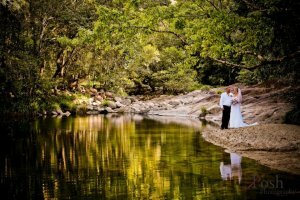 Surrounded by ancient rainforest, natural waterholes and a pristine waterfall, the magical rainforest surrounds will provide an amazing backdrop to your special day. 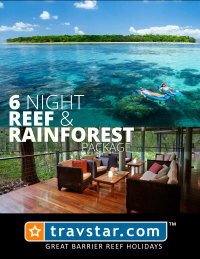 Accommodation comprises of just 15 "Bayans" (rainforest cabins) nestled in the rainforest. The Bayans are set in different levels of the rainforest designed for privacy and to take in the different aspects of the rainforest. The Julaymba Restaurant showcases the very best of contemporary Australian cuisine with a native twist, drawing inspiration from the local surrounds. The Daintree Wellness Spa offers a very special experience, with approval from the Kuku Yalanji elders, their spa treatments transpire the wisdom of an ancient culture, medicines, spirituality and healing. Port Douglas Valley Retreat is a beautifully designed 'Queenslander' style house featuring wide verandahs, high ceilings and an extensive use of local timbers. It is located at the end of a quiet cul-de-sac in the Mowbray Valley. The home is very private, no other house can be seen from its windows. Inside you will find a large well-equipped kitchen, 3 bedrooms, 2 bathrooms, powder room and guest library. There are three different dining areas and a spacious, comfortable lounge. Outside you will find a private outdoor shower in the garden by the swimming pool. 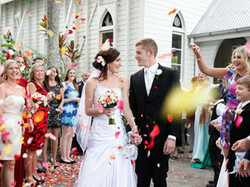 The home has beautifully landscaped tropical gardens ideal for your special day. The grounds can accommodate up to 25 people for a wedding, and the home can sleep a maximum of 9 guests. It is an easy drive into Port Douglas for shopping, reef tours and dining.There is no telephone coverage but WiFi is provided free of charge.